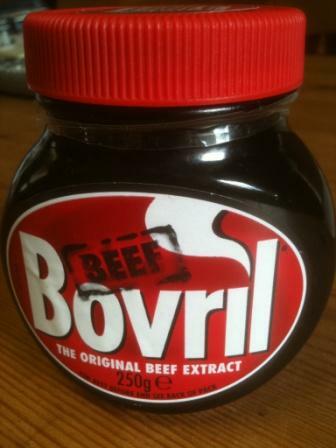 I have not tried Hot Bovril or Beef Tea for 20 years but under the effects of a cold (Man Flu!) I tried a cup recently and although I could not taste or smell it, very good it was, I would imagine a slightly salty beefy drink! Another option is the Oxo cube topped up with hot water a pinch of white pepper & served in a mug, have you noticed Oxo cubes are now X shaped! Both Bovril & Oxo have fed various Armed Forces over the years with Bovril being invented to feed French Troops in 1886. Oxo was included in WW1 troop rations and even sponsored the 1908 London Olympics. This entry was posted in Beef, Recipes and tagged Beef, beef tea, bovril, cold's, flu, oxo, shin, skirt, tea. Bookmark the permalink. This is one of many recipies for beef tea. However I have not found one that tells you how to use the cooked beef residue. Waste not, want not!